Gary Neville has challenged his Sky Sports colleague Jamie Carragher to wear a Manchester United shirt as Monday Night Football returns for the new season, after agreeing to wearing a Liverpool jersey as part of the deal. 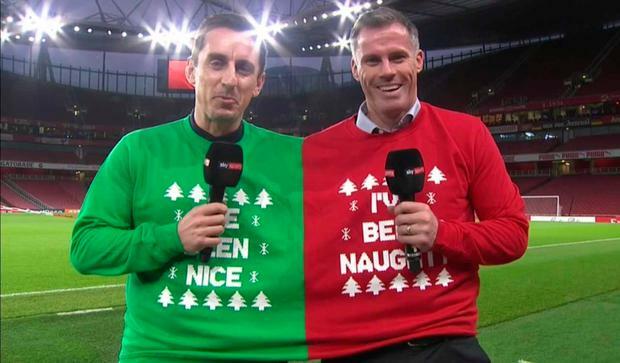 Liverpool great Carragher has been pressing United legend Neville to wear a Reds shirt after he lost a penalty shoot-out against his on-screen sparring partner earlier this month, but that prompt was quickly rejected. Neville argued that Carragher has previously reneged on a bet to wear a United shirt live on air, yet the mayor of Manchester (Andy Burnham) is among those urging the dup to strike a deal that could result in a bumper payday for chairs as the jersey will be auctioned off. Carragher has got Liverpool new-boy Xherdan Shaqiri to sign a Liverpool shirt for Neville to wear, after the pundit was critical of the Swiss international in the past and it remains to be seen whether the duo will now swallow their pride and wear the shirts on air. We will certainly all be watching at 7pm on Monday night. Kevin Palmer Chelsea and England forward Callum Hudson-Odoi has confirmed that he will not play again for several months after suffering a ruptured Achilles tendon in Monday night's 2-2 draw against Burnley.